shmups.system11.org • View topic - AV-DRIVER: Universal RGB A/V Amplifier - Ideal for PCE/TG16! AV-DRIVER: Universal RGB A/V Amplifier - Ideal for PCE/TG16! Post subject: AV-DRIVER: Universal RGB A/V Amplifier - Ideal for PCE/TG16! A general purpose AV driver amplifier created by Tim Worthington! 4 channels video, 2 channels audio, 1 channel sync. It works well in the PC Engine and in other applications too. There are lots of ground points for convenience. Each video amplifier has a set of jumpers for setting the gain (0-4) and another for setting the attenuator (5-7). There is also a bias setting which is common to all video amplifiers. Gain and attenuation must be set the same to every amplifier. The bias setting must match the amplifier gain setting. Gain is variable from 1.0 to 4.1 in 0.1 increments. Gain is set in binary with jumpers 0-4 representing bits 0-4. For example, to set the gain to 1.6 (good for the PC Engine), you would close jumpers 1 and 2. There is an input attenuator on the input which can be set to three valid states. 5 = closed, 6 = open, 7 = open. no attenuation. Jumpers J1 and J2 relate to the sync amplifier. J1 should be open for the PC Engine and closed otherwise. This is a special feature for the small sync signal on the PC engine. 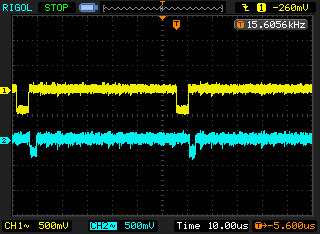 J2 should be closed for a 75 ohm sync output (normal) or open for a TTL sync output (such as an arcade monitor). If the sync buffer circuit is not used J1 and J2 should be left open to save power. Audio is set by the level control potentiometer. The audio amplifier gain is fixed at 6. Note: Never solder on the component side of the board! 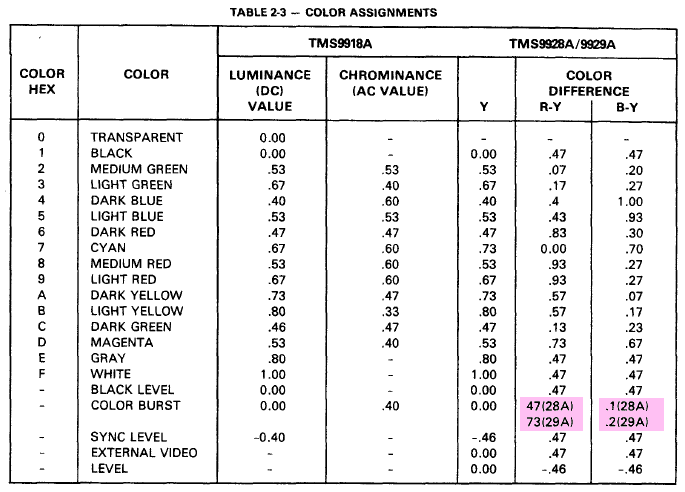 The Hu6260 RGB video output is 0.864 Vp-p. To bring it close to 1.4 Vp-p the gain needs to be set to 1.6. To do this close the '1' and '2' jumpers for each channel and bias. Remember that the bias should always set the same as the gain (it's not an independent control). If you find the 1.6 gain too dim, also close jumper '0' for each channel and bias for a 1.7 gain. 1. 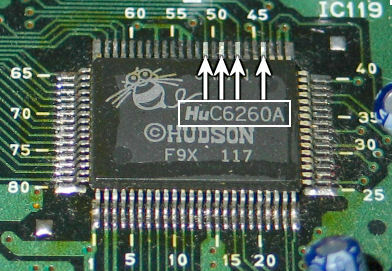 Disassemble the console and find the HuC6260 chip on the motherboard. 2.Find the power supply decoupling capacitors close by. 3.Work out which are for the digital side and which are for the analog side. Usually there are three or four on each side. They can easily be grouped together by their proximity and the large power tracks on the PCB which they connect to. It doesn't matter which group is digital and which is analog. 4.Pick one from each group (it doesn't really matter which one exactly) and use the continuity check feature of your multimeter to confirm that the capacitors are indeed for power supply decoupling. Both caps are connected between 5V and ground. 5.Remove two caps from the motherboard (if necessary) and replace with the 4.7 uF replacement caps. Last edited by RGB32E on Sat Jun 11, 2016 12:42 am, edited 4 times in total. So what advantage does this have over say Tim's standard RGB amp for the PC-Engine, if all someone is wanting is getting an RGB signal out of there PC-Engine?? , i see that it has an audio amp and control but that wouldn't really interest me a great deal to be fair, and i guess this would be more money that the standard rgb amp that Tim does?? Ok...proper release by next weekend! As I've said before, the hardware is ready, it's the documentation that's slowing me down. Now I'm devoting my full attention to it. The audio driver is needed for PC Engine consoles which normally output RF only (like the little white one). I'm interested in this for my supergun, would love to see the documentation. I thought you made little RGB Amp kits for the PC-Engine? Regarding the audio driver, im guessing thats only needed if you carry out an RGB mod on a PC-Engine and dont replace the din socket on the side with a 9 pin mini din (megadrive 2 type)?? The original PCEngine only had RF output, and not the 5DIN A/V output found on later revisions. A 9MDIN connector is never the way to go and is a dubious pursuit. Read here why using a 9MDIN with Sega pinout is not such a good idea. Why is an audio amp required for the old PC Engine ? I mean, I have literally had a few dozen PC Engines on hand during the past decades, with all kinds of RGB mods, but never with any special attention given to the audio circuit. Isn't the line audio level identical on the extension port on all PCE revisions and versions ? I would guess it has too, otherwise the mixing circuit in the interface unit wouldn't work with all units. Hmmm so what connection is recommend then?, as more or less all mods ive seen seem to use the MD2 din connection?....i mean i have a spare MD2 scart cable here that can be used! It isn't a requirement to use. The interface units/TG16 Boosters all contain buffering/mixing circuits before the output on RCAs. The audio section just provides an alternative to the not quite right "wire to expansion connector" method. Anything that doesn't contain additional components in the cable is reasonable, which was the whole point! And yes, those mods have a gain of 2, instead of 1.6, so you could say they made more than one misstep. 1. 8MDIN with XRGB-mini pinout. 2. 8DIN. Preserve the 5DIN pinout on newer PC Engine (Duo) and Turbo Duo systems and add RGB to the additional 3 pins. It's what dojindance and others including myself have been doing for years. 3. VGA (HD15) & 3.5mm or 2 RCAF. Brilliant! The AV-DRIVER has an option for TTL level sync output, so this would be perfect for powered VGA switchers or Extron BNC switchers and the like. For both 1 and 2: You can add a switch for 8(M)DIN pin 3 to switch between composite video and composite sync if you want to have the option to use composite video output. No problem! That cable should work just fine given the right RGB mod installation. Nice, do we have a price for this AV-Driver yet?, it it likely to be more the $20? Hi folks, I'm one of the lucky few that actually has had the AV-Driver installed in my USA TG-16 for a few months now. Initially, the system was using one of those "Broken" RGB amps that seem to be very popular right now. I can compare and contrast them for those interested. Here are my notes, the good, the bad, etc. which will help you decide if this is for you. - USA TG16 is RF only so upgrading it to RGB is no brainer. Lots of instructions on the net on how to remove the RF port and replace it with a port of your choice. My port of choice is the 9 pin mini-DIN. Same one Sega Genesis Model 2 uses. No need to cut any plastic, it looks stock. You also can use all Genesis cables on the system (composite or RGB). - The schematics for the TG16 are WRONG! --> left/right audio pins on expansion port are unamplified! 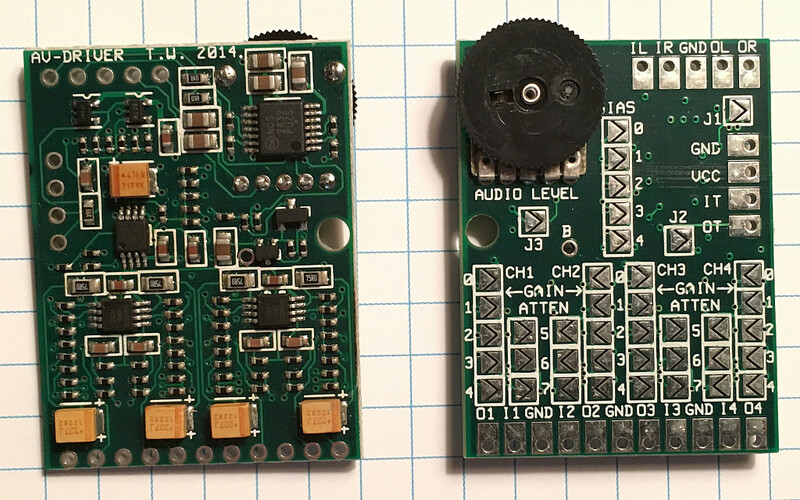 - has on-board audio amplifier! Set it to the level you want using variable resistor/wheel and you're set! - allows you to select gain on brightness levels ("Broken" style amp is fixed amplification) This might be too complex/overwhelming for some people. I for one found the "Broken" amplification settings to be more pleasing to my eyes. The settings suggested by Tim for TG16 are too dim/bland. It took me a while to figure out the correct settings. You need to understand how binary numbers work to dial in the correct settings using the solder pads. - (CON:) jail bars are still here folks. Maybe not as visible as using the "broken" amp.. but they are visible in solid backgrounds. No doubt about it. - The addition of the audio amp sealed the deal for me. But in applications where audio amp is not required, the video quality is on par with other amps. As always, another solid product from Tim!!! But again: it seems quite near to proper line levels, doesn't it ? Initially, the system was using one of those "Broken" RGB amps that seem to be very popular right now. I can compare and contrast them for those interested. Which amps are the broken amps you are referring to please? And regarding the audio from the mod guide ill be following your grabbing the left and right channels from the parallel port on the rear on the PC-E and connecting it directly to the din socket, so your basically getting the same audio as a stock PC-E no?? -My port of choice is the 9 pin mini-DIN. We've already discussed why this isn't such a good idea. The settings suggested by Tim for TG16 are too dim/bland. It took me a while to figure out the correct settings. True, which is why I use a gain of 1.7 instead of 1.6. 1.6 is slightly under while 1.7 is slightly over 0.7Vp-p at the destination. Indeed! There are many other applications where the adjustable gain is helpful including the SNES mini, where a encoder bypass mod would be better served with a gain of 1.7 instead of 2.0 (THS7314/NJM2267). I'd imagine Tim can share his measurements of the audio at the expansion connector. The one you're interested in ordering in the thread you started. I've built the very same THS7314 circuit years ago and prefer the AV-DRIVER. Last edited by RGB32E on Sat Oct 24, 2015 8:16 pm, edited 1 time in total. So whats actually 'broken' about them?, why do you prefer the AV-DRIVER just of the audio amp?? A person named "Broken" used to sell them. The board was designed by Micro, but Broken replaced the 75 ohm resistors with 100 ohm resistors to make the colors less bright. I have the same ones for sale including the 100 ohm instead of 75 ohm resistors. I am wondering, Would this also work for the SNES mini/jr RGB restore ? On the assembler forums there is a full thread to get the RGB signal in line. Since the ths3741 seem to be too bright in some cases. Line level, sure .. but I need to turn the volume knob on my PVM almost all the way to the max to make it audible! My other RGB consoles play at 30%. I must of missed this. Care to share? I'm surprised by why it's not a good idea. They are not the same person. Micro lives in Germany IIRC. You're right!! Micro designed it, but I got mine from Broken. Biggest change he did was change the 75 ohm output resistors to 100 ohm. Apart from that, same amp. 1. The signal audio level from the expansion port is lower than other game consoles and comparable equipment like CD players. Most line level signals are now 3Vp-p (1V RMS), where the PC Engine is about 0.5Vp-p (from memory). That's ratio of 6:1 or, more appropriately for audio, 16 dB. Most people are sending audio and video through the same cable and as a result there will noise from the video signal coupled into the audio. Both from capacitance between the wires and as a voltage difference in the ground (since audio and video share the path, and video signal current is significant). Basically, there's a source of noise from the video signals and with that being constant, an increase in the gain of the audio will increase the signal to noise ratio proportionally. The audio channel of the AV-Driver had a low impedance output of only 100 ohms. Compared to > 1k of the untreated audio signal (which was never designed for driving cables!) means it's even more immune to higher frequency noise coupled from the video. This is less important when a separate, shielded audio cable is used instead of a combined a/v cable. 2. The audio signal from the expansion port is not protected at all. It's connected to the pin on the CPU with a copper trace on the PCB. Signals to external connectors for ordinary users should have protection against ESD, voltage spikes, and improper connection. Without any protection in place, unless the user is careful, it is possible to cause damage by shorting out the signal or connecting it to an output instead of an input (happens all the time when phono/RCA jacks are involved). Even plugging in a connection to a TV while it's switched on could pop the CPU if you are unlucky. With a proper audio driver circuit, there is no risk at all. The user can do all the silly user things like plug the audio signal into five different connections on the TV until he find the right one, short the left and right signals together to make mono, short the signal to ground with a badly wired cable, touch the connection with an electrostatic charge, etc, etc. Hey Tim, do you know how your amp fares with the TMS9928 VDP by any chance? I've been constantly fiddling around with the component video mods on both my ColecoVision and SG-1000 II (which could be considered kludgey at best) and having a solution that would work with almost any display would be fantastic. I've has a look at my Colecovision which contains a TMS9929A VDP. The AV-Driver alone isn't enough to make the colour difference signal from the VDP into standard component video. If you try it, the colours look wrong. Black isn't even black and no amount of adjusting the signal levels makes a satisfactory picture. When I turn my Colecovision on without a cartridge it shows a screen with logo and basic instructions. After a few minutes the screen goes blank. Here's a oscilloscope capture while in this blank state. Channel 1 is the Y signal and channel 2 is the R-Y. Measured at the pin of the VDP chip. The Y signal has a sync pulse, that's normal, but what is that on the R-Y signal immediately following the sync pulse? This part of the video signal is called the back porch (aka colour burst area). It's small space between the sync pulse and the start of the video line. It's usually used as a reference for the black level of the signal. A look in the datasheet shows it in normal operation. Anyway, I don't know why it is this way, but the black level and colour burst level are different. The TMS9928A (NTSC version) has this problem on the B-Y signal only, the TMS9929A (PAL version) has it on both the R-Y and B-Y signals. In order to get standard video out of this, the colour burst area must be set to black level to provide an accurate reference for the rest of the signal. It's possible to achieve this with a blank + clamp circuit and some R/C timers, but I'm not going any further at the moment. I just want to point out exactly what is wrong with the video from the VDP that is causing the trouble. Tim, much will these devices be please? Wanted to add that I am using an AV-DRIVER in my Turbo Duo-R and am quite happy with it. I put it in a little while back but didn't have a chance to really test it out much as I also wanted to recap the system and replace the laser as the optical side of things was really having issues. Finally put it through the ropes with many games this past weekend, and really enjoyed having RGB. I believe I went with the recommended gain of 1.6 on my system, and the brightness level seems to "fit" with the other consoles I wire up to my TV via xrgb. For the output, I replaced the 5 pin DIN with an 8 pin DIN and re-purposed the +5V line as csync - leaving composite video intact. I also have to say that I am very happy that TTL csync output is available on the board. I use a powered VGA switch for all of my consoles, and the input active detection is based on the H-Sync pin on the port. Standard 75 ohm, TV ready csync as well as cvideo are not strong enough to enable the input. With the AV-DRIVER TTL, the switch fires right up and rocks PC Engine RGB.